GREENSBORO, NC -- Getting ready for a hot Father's Day weekend here in the Piedmont. As you might expect, we'll have some heat, some humidity, and a low chance for a few pop-up storms each afternoon. Things will only get hotter heading into next week. High pressure is in control of our weather. For today, it brought us some drier air. Tomorrow, it will be shifting farther south and farther offshore. That will mean our heat pump of southwesterly winds will return in the Carolinas. We'll see temperatures warming into the upper 80s Saturday afternoon and a bit more humidity as well. The chance of pop-up storms will be low, but not impossible. 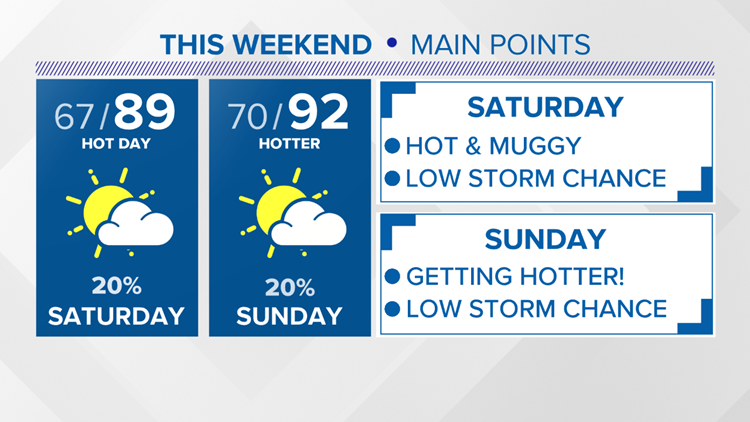 WEEKEND -- Mainly dry this weekend aside from a very isolated storm. Getting a bit hotter each day. Yes, the humidity will be back. Father's Day will be hot and muggy. Temperatures will top out in the low 90s, but it will feel a bit hotter than that when you factor in the humidity. Any threat of storms will be very low. Only a stray pop-up is possible during the afternoon. If you do have plans this weekend, take it easy outside. An air quality alert is in effect for those that have respiratory issues. A heat wave will be in full force next week with temperatures into the mid 90s, feeling like around 100 each day.